Regular religion was way too abstract. It was meaningless. The slaughterhouse was real." In features like The Thin Blue Line and The Fog of War, Errol Morris has established himself as one of the foremost documentarians of recent decades. But not all stories require a full-length film, and hence this series, shown in the U.S. on Bravo, allows Morris to assemble a sort of sketchbook�unusual characters, extraordinary circumstances, an emphasis on the grisly and the macabre are staples of Morris' work, and you'll find those qualities in spades in these seventeen short films, produced over the course of two television seasons. As you might anticipate, they're a little uneven; some of the stories feel padded out, while others are absolutely galvanizing. But if you've got a taste for Morris and his skeptical view of the darkness of human nature, these are likely to appeal to you. Discs One and Two hold the eleven episodes of the first season of the series; Disc Three, the six episodes of Season Two. As the title indicates, generally these are films of one person telling their own story, and Morris has configured a peculiar camera setup for this purpose. He's not in the room with his interview subjects, but appears on a monitor, into which they look directly, as a multi-camera shoot goes on around them; the copy on the back of the DVD case reports that Morris has given this device the cutesy name the Interrotron, and it's certainly effective at maintaining eye contact with his subjects, who are pretty unflinching and candid about their own histories. Some are here because of their line of work�Mr. Debt is a look at Andrew Capoccia, an attorney who takes on credit card companies, on behalf of those who are drowning, overdrawn, and able barely to make their minimum monthly payments. If the bill collectors are calling, you want this guy on your side. Perfectly lovely but someone whom you probably wouldn't care to meet in the course of her professional life, on the other hand, is Joan Dougherty, who has filled a gruesome little niche in the marketplace with a company that cleans up after the dead and neglected. If the smells from an apartment in the building are unbearable and you haven't seen its inhabitant for days, there's a possibility that somebody is in there dead, decaying, food for maggots, and Dougherty will clean this up for you. Lovely. Crime is a focus of many of Morris' stories�especially compelling, for instance, is Gary Greenberg, a psychologist who started a fervent correspondence with Ted Kaczynski, in the hope of landing an interview, and what he learns and sees In the Kingdom of the Unabomber is creepy and fascinating. Creepy in her own special way is Sondra London, the subject of The Killer Inside Me, who's got a thing for serial killers�her high school boyfriend turned out to be one, and years later she romanced another death row inmate, the love of her life. Morris is sparing in his use of archival clips, but when he does, it's hypnotic—it's hard to know how to react, for instance, when London's serial murderer inamorata uses his allotted time to speak at his sentencing hearing as his opportunity to serenade his beloved with a song of his own composition. Gee, aren't those crazy kids so cute and in love? There's a Diane Arbus-like quality to Morris' fascinations, too, and a whole lot on freaks and dismemberment�Saul Kent runs a cryonics lab, for instance, and in I Dismember Mama he tells us about facing charges for the murder of his mother, whose head he was keeping in the deep freeze in an undisclosed location. And sometimes it's just part of the job�Gretchen Worden is the director of the M�tter Museum, a gruesome catalog of physical abnormalities preserved in wax and fluid, atypical faces looking up at us, Smiling in a Jar. Morris can be a little too fond of cutting away to stock footage�for some reason, Orson Welles' films get a lot of play, and you'll recognize clips from Othello and The Lady From Shanghai�and they tend to do a little too much indicating, when the subjects are very capable of speaking for themselves. 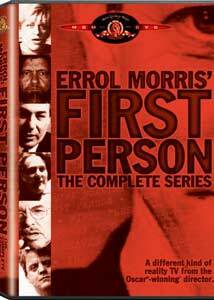 Two of the episodes in the second season run close to an hour, but the rest are under thirty minutes, and the last is especially fascinating�it's a visit with The Smartest Man in the World, a genius working as a bouncer, the perfect emblem of a Morris film, full of intelligence and an almost fatalistic sense of the futility of all human endeavor. Image Transfer Review: Twelve of the episodes are shot in the 1.78:1 ratio, with the remainder at 1.66:1, and they're all reasonably well transferred, though sometimes the video resolution is wanting. Audio Transfer Review: Some of the episodes are overscored, and the pulsing, moody music starts to feel a little generic, testing the lower ranges of the dynamics of the transfer. Extras Review: As with the other releases of Morris' work, there are no extras, which is unfortunate, for no doubt even a modest amount of information, on the director's technique and setup especially, would have been very interesting. Seventeen uneven but almost always captivating short films from Errol Morris, sort of an audiovisual peek into a macabre reporter's notebook.